Praised by the New York Concert Review as “effortless precision in his intonation and intense expressiveness,” acclaimed German violinist, Sven Stucke, has appeared with orchestras and chamber ensembles throughout Europe, United States and Asia. 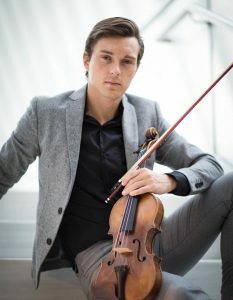 Winner of the Louise-Henriette International Violin Competition and the Queen Sophie Charlotte International Violin Competition, Mr. Stucke has made a number of CD and radio recordings for RBB, WDR, MDR and SWR. Mr. Stucke has appeared frequently as soloist in such world-wide prestigious concert halls as Carnegie Hall, Chamber Music Society of the Lincoln Center, Konzerthaus Berlin, Rachmaninov Hall Moscow, Herkulessaal Munich, Laiszhalle Hamburg, Liederhalle Stuttgart, NDR Broadcasting Hall Hannover, and the KBS Hall in Seoul, Korea. Mr. Stucke is the Artistic Director of the Karwendel Music Festival since 2015, founding member of the Karwendel String Quartett and has been invited for masterclasses in Asia, Europe and the US. Mr. Stucke has been awarded scholarships of the Maggini Foundation, International Association of Wagner Societies, Manhattan School of Music, Associazione Intonarumori and Doms Stiftung. As outstanding artist he collaborated with renowned artists including Pinchas Zukerman, Vadim Gluzman, Rainer Honeck and Augustin Dumay. Mr. Stucke plays on a famous 1765 T. Balestrieri violin from a private collection.